Guess I finally got it done! Somewhat different from what I imagined, more useful than I thought, but very nifty nonetheless and probably fun to play, that's what counts. Testing out the Spells and HLAs (especially!) was great fun, although many bugs were tough to fix. I have attached the Readme along with 2 screenshots taken long ago. Comments, Flames, Reviews etc, can all be posted here. Every Conductor sparks a most enchanting charm that they use to electrify their audiences in every sense of the word. Just through their performances, Conductors can channel electricity and possibly even set alight all those who incur their wrath, and their mastery of Electrical and Lightning spells is unparalleled even when compared against Mages. However, their limitations are many. Their art requires use of small single-handed weapons, the proper timing means they may not be quick on their feet while performing, and since their calling is to be the centre of attention, a Conductor can never use invisibility of any sort. - may not have Proficiency Points in any weapons or styles except Short Sword, Dagger, Single Weapon Style. - Charged Magic Missiles (level 1) : 1d4 Electrical Damage per missile. learned only at level 9. - Conductor's Insulation (level 2) : grants 70% Electrical Resistance. lasts 10 turns. 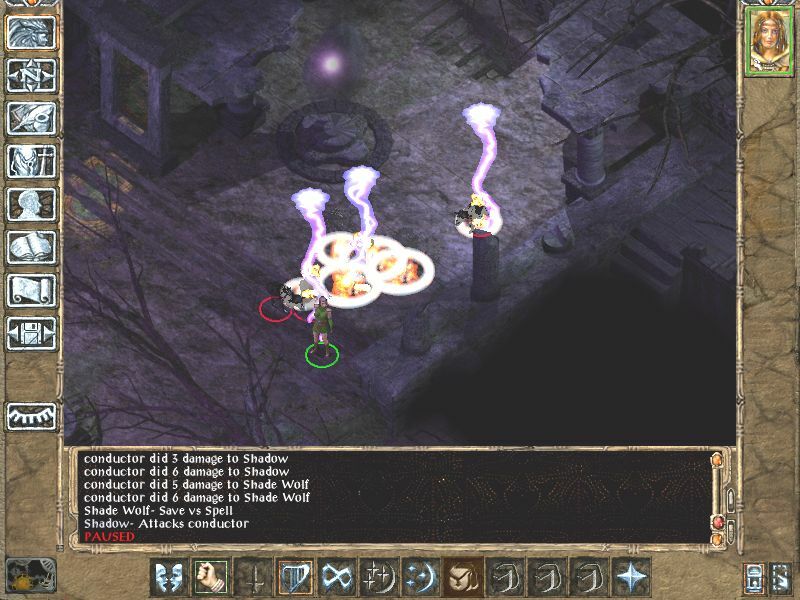 - Lightning Blast (level 3) : Everyone in a 30' radius of caster, including allies, takes 10d6 Lightning damage. - Conducive Surge (level 5) : single target spell, target takes -4 to Save vs Spells, -30% Lightning Resist, -30% Fire Resist, lasts 15 rounds. I always felt the class suited him better anyway. Now he can literally be the centre of Attention. Note : I just put it under Hidden Kits as its too minor to warrant its own forum. Its definitely NOT a Hidden Kit. Edited by Zyraen, 04 January 2011 - 01:13 AM. Shouldn't it be without "!"? Didn't you mean to check if Haer'dalis is a blade and if he's then to change him into Conductor? Edited by Lava Del'Vortel, 03 January 2011 - 01:04 PM. No worries. I changed Haer'Dalis CRE to a normal Bard without a Blade Kit, so yes I am checking if he's not a Blade then swapping him to a Conductor. I have to use a manual script to change him, because every computer may have a different entry for the installed Conductor (Z#CONDUC) kit. There should be a way to TP2 search the IDS for the right code and then change it, but I'm too n00b to do that. Edited by Zyraen, 03 January 2011 - 04:48 PM. Checking some other mod's tp2 was too much work? Actually, that was for the best, since the code used by all current mods doesn't actually work for large installations. Edited by Zyraen, 06 January 2011 - 06:25 AM. Heya again, Zy! Long time no see, hotshot modder, heheheh. Just got back to the modding scene after that three-year hiatus with Neverwinter Nights. Was curious if you'd be up for me trying my hand at branching Conductor into a Fire or Fire + Air version, figured I might as well ask first. So I was digging around in Conductor, making a custom version for my personal use, and discovered that either A) I'm an idiot and reading IEEP wrong, or B) your documentation is incorrect about Conductor's Magic Missle (Z#CDMGM1.SPL) damage, as it's type, while correctly assigned to Electric, is actually 2d2 per missle, from what I can see: Dice Throws 2, d 2. This conflicts with your stated 1d4 in the documentation Setup-Conductor.tp2 and the spell description. Edit: You also set its school as Invocation, rather than the stated Evocation. I'll keep this post updated for now as I bring the spells and abilities in line with the documentation. - Name updated to Charged Magic Missles. - School changed from Invocation to Evocation. - Description updated to accurately reflect the changes. - Modified to be gained at level 4 (as it's a 2nd Level Spell), starting at 4d4 Electric. Added to Total Number to make room for level 5. Still capped at Level 18 with 18d4 Electric, as per Zyraen's chosen default. - Description and Setup-Conductor.tp2 updated to accurately reflect the changes. Due to unfamiliarity with spells calling / depending on others (Z#CDLBL.SPL, Z#CDLBLA.SPL, Z#CDLBLB.SPL, Z#CDLBLC.SPL) I'm only going to touch Z#CDLBLB.SPL so I don't break anything too horribly, which is the spell that governs the actual damage / area / etc. - Total Number extended to 6, starting at Level 10 Bard (earliest level L4 spells can be learned at) with 2d6 Electrical / 3d6 Electrical, capping at the original 10d6 at Level 20. Tired, going to quit for now. Lemme know if you'd like a copy of this version for testing, updating, or whatevs, Z! Also, feel free to spank the stupid outta me if I broke something, boyo. Edited by Jenavee, 20 December 2013 - 11:20 AM. Sure, feel free and have fun. The SPLs typically have the numbers and "hard" stuff, but the names and descriptions are typically based on the content inside the TP2, during the COPY command I believe I used the various codes after that to alter the games into my custom names. All this is from memory, I'm typing from my work computer lol. I know! I was comparing, side-by-side, the tp2 and the SPLs, which is where I was seeing discrepencies. Still haven't gotten around to redoing all that work, UGH. Got all the way through BG1 and started BG2 before I hit a game-breaking bug. Edited by Jenavee, 08 January 2014 - 02:05 AM.